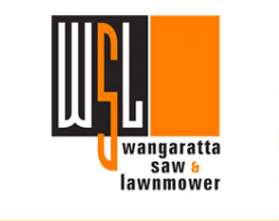 Sunday 8th February reached a very hot 39 degrees but didn’t dampen the enthusiasm and scores produced at the Wangaratta Clay Target Clubs 100 target 5 Stand Sporting Clays shoot. Considering the heat , some excellent scores were achieved by a good mix of both ACTA and Field & Game members on the day. One lady competitor was visiting from New Zealand and thoroughly enjoyed the first rate facilities at the club. Once again, club secretary Brett Jory won the overall and AA grade trophy on 88/100. This result is even more impressive as Brett was feeling unwell on the day, his determination and skills carried him successfully through the event . 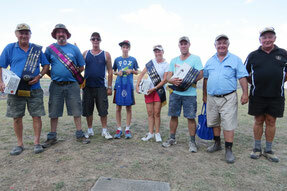 Visiting Yarrawonga shooter Trevor Beach also put another top performance in finishing on 84/100 winning 2nd in A. Consistency once again paid off for Christian McGauran taking out A grade 75/100, ahead of Chris. Kloppenborg on 69/100. Enthusiatic shooter, Reg Carmody had an excellent day by hitting 77/100 winning A grade. Junior shooter, Rhys McGauran took out 2nd place on 58/100. 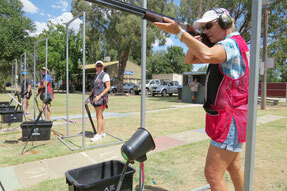 Lady shooter, Angela Kloppenborg had a close win in C grade 58/100. One target behind was all rounder Brad Sparling taking out 2nd. At the conclusion of the day, everyone relaxed inside the air conditioned club rooms for the presentation of trophies and a cool drink. L to R: Reg. Carmody, Brett Jory, Brad. Sparling, Rhys McGauran, Angela Kloppenborg, Christian McGauran, Chris. Kloppenborg, Trevor Beach. L - R: Rebecca Kirley, Rochelle Hunt, Angela Kloppenborg, Petra Deadman (from NZ).